1. Two GTYC parking passes will be issued to each member for the term of April 1 to May 31. Parking passes will distinguish between Active and Associate member levels. 2. The pass, in form of a small interior sticker, is to be displayed in use on the interior of the windshield of a vehicle. 3. 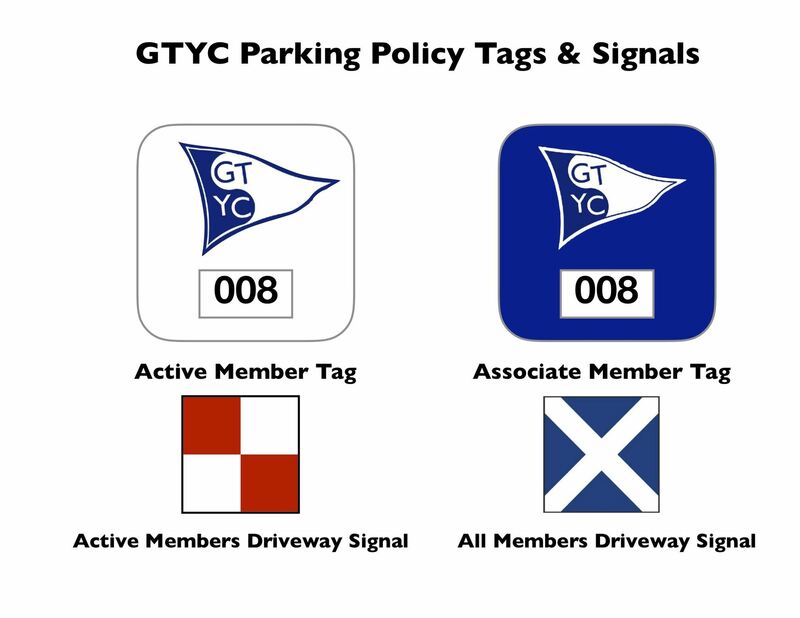 Parking in the GTYC property parking lot may be limited to vehicles displaying club issued parking stickers on designated occasions. a. When a Red & White “U” flag is displayed at the north driveway entrance to the club, parking is restricted to members vehicles displaying white club-issued parking stickers. b. When Blue & White “M” flag is displayed at the north driveway entrance to the club, parking is restricted to members vehicles displaying the white or blue club- issued parking stickers. 4. Vehicles without member parking stickers may be liable to immobilization (via boot) and/or towing. a. If an unmarked vehicle is immobilized, by GTYC officer or staff member, a note (example attached) will be left on the windshield of the vehicle with instructions as to how gain release of the immobilizing device. b. A fee up to $50 may be charged as a fine for unauthorized parking on club property with revenues generated contributed to the Junior Sailing Fund. c. After a period of four hours from the time of immobilization, GTYC officers or staff members may arrange towing of a vehicle from the property. 6. Handicap Parking access supersedes all club parking designations. 7. Parking rules are suspended for the duration of rental events at the club. 8. One parking space is reserved for the use of the Commodore. 9. Parking without restriction is available for up to 24 hours at the GTYC-owned Bluewater Hall facility. 10. On Wednesdays during the GTYC sailing season, crew members of dry storage boats are encouraged to only have one vehicle per crew park in the GTYC property parking lot. 11. Vehicles must not be parked at the club for more than 24 hours. Members that would like to leave vehicles on club property for longer than 24 hours are encouraged to park at Bluewater Hall. Long-term parking (longer than 36 hours) are encouraged to notify GTYC/BWH management. 12. The launch ramp shall remain free of parked vehicles. 13. Both the North and South driveways shall remain open to club member traffic. 14. Only trailers of dry storage renters may be parked in the GTYC property parking lot. Trailers of full members who launch boats from the GTYC ramp may be stored at the Bluewater Hall lot while the boat is in use for no more than 24 hours or a period arranged with the GTYC General Manager. 15. Parking on the property of the Viridian Building is forbidden without express permission of the Viridian Building management. 16. Parking on the State of Michigan right-of-way along S. West Bay Shore Drive (M-22) is illegal and expressly discouraged.